Properties in Sillars average 4.5 out of 5 stars. Property 3: Peaceful family-friendly rural retreat. Rejuvenating & stylish. A gorgeous spot. Charming former railway cottage in peaceful setting. Close to local amenities. Property 5: Charming former railway cottage in peaceful setting. Close to local amenities. Property 8: House on the banks of Vienna. Property 10: Holiday Cottage with Scandinavian Hot Tub for exclusive use of guests. La Belle Grange. A beautifully restored barn with private hot tub. Property 19: La Belle Grange. A beautifully restored barn with private hot tub. Stunning two bed stone cottage, large garden. In beautiful surroundings! Property 26: Stunning two bed stone cottage, large garden. In beautiful surroundings! Property 33: Comfortable cottage with heated pool and fishing ponds labeled 3 ears. Lovely escape to the country, chateau included! This is a fantastic place to come and relax. It has modern amenities so it is both welcoming and comfortable. 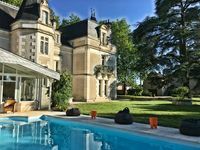 The owners have done a great job styling it in an original and tasteful way, unlike many country properties I've seen, and the garden and pool were a perfect playground for my daughter. Happy to recommend.